Williamsburg Bridge Plaza is slated to receive a complete renovation, officials said. WILLIAMSBURG — A transit hub serving thousands of straphangers near the Williamsburg Bridge is slated for a complete renovation that includes a new restroom and waiting area, officials said. Street trees, widened sidewalks, benches, an automatic toilet and a waiting room are all planned for Williamsburg Bridge Plaza, located by Broadway between Roebling and Havemeyer streets, a representative from the city's Department of Transportation said. As part of the renovation, the city will also reconfigure the roadway around the plaza and install new sewer mains and catch basins, DOT spokesman Rob Thompson told Community Board 1 Tuesday. "There's not much room for people who wait for buses," Thompson said of the current hub, noting that about 41,000 used it each year. 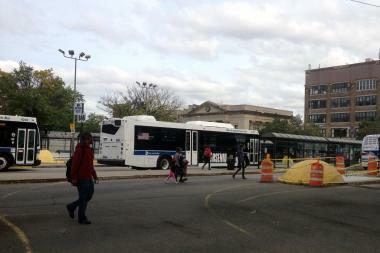 Bus lines that pass by the plaza include the new waterfront route B32, along with the B44 and the B39. Construction is slated to begin this spring and be completed by the summer of 2015, Thompson said.